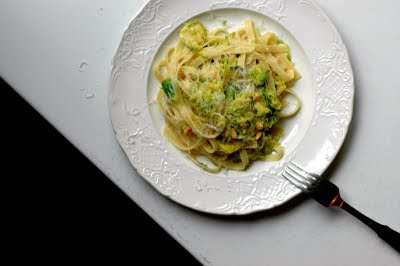 My friend Jen recently made Molly Wizenberg's Pasta with Hashed Brussels Sprouts and Pine Nuts and raved about it. You can find brussel sprouts at the farmers market these days so I thought I would give it a try. I used fresh noodles instead of dried and a little bit extra of everything for the "sauce" because I hate when pasta dishes are too noodley. Verdict: it's quite delicious and so different from any pasta I've ever made. I will definitely make it again. Great way to eat brussel sprouts too which are high in vitamin C and K and offer lots of wonderful health benefits. I just received an email from my friend Amy who saw the recipe on my blog and also made it last night using brussel sprouts from the market. She and her husband loved the pasta and her husband liked it so much he thinks it should be a regular at their house. Thanks for the great recipe Jen (and Molly! ).